How’s a Support Officer’s workday? 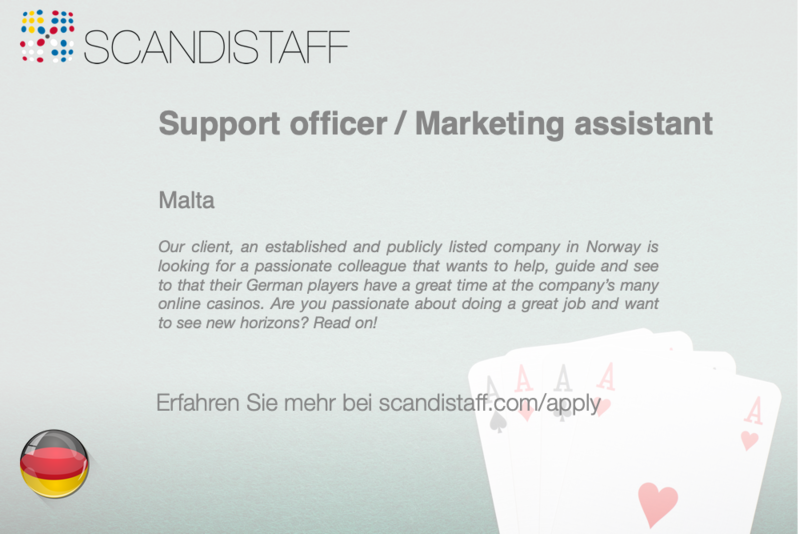 As part of the customer service department and in particular, the small German team will you be helping the clients with queries related to accounts, payments, promotions, KYC and technical issues. Via email and chat are the players contacting the company when they have problems ranging from opening up an account, trying to deposit/withdraw money or experiencing difficulties with browsers, slots or uploading documents. Apart from answering player queries will you also be assisting with marketing activates such as CRM, translations, content writing and similar tasks. You’ll be representing all the company’s brands that are active in the German market which means that you’ll sometimes be managing several chats at the same time. What is most important is that you have a nice tone of voice (in writing) and understand the German peoples’ culture and how to treat them in a great way so they feel welcome, special and experiencing a great gaming experience. We are looking for someone that’s ambitious, takes pride in his/her work and that is ready for a challenge and adventure of a lifetime. Naturally, you’ll need to be native in German and fluent in English (a small number of contacts will be in English).